This is a listing for a super cute Halloween Pumpkin with a wonky tooth. 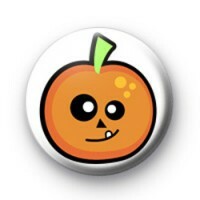 Not all Halloween badges have to be terrifying and spooky, right! This one is so sweet and ideal for kids parties and for those extra nice trick or treaters.